Poverty Tourism or Helping the Needy? So the other day we went on a Favela tour in Rio, something the guidebooks claim you have to do before you can say you have truly experienced the city. We did some research online as to which company to go with, wanting to make sure that the money we paid would actually be pumped back in to the Favela, rather than some seedy Brazilian tycoon living in a penthouse in Ipenema. We settled on a company whose bold claim was that between 60 and 70% of the money we paid would be put into one if their charity projects in the Favela itself. For us, if not the rest of the people on our tour, this was important as the idea of simply walking around an area where people live in some of the poorest conditions in the country, simply to snap photos if their poverty didn’t sit well. 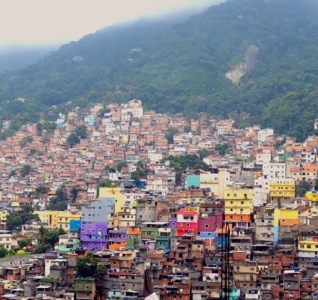 And so we set off to visit the Rocinha Favela, a “town” within a city, numbering about 300,000 people. This is by no means the largest in Rio or indeed Brazil, where nearly 40 million people live in these kind of conditions. We toured through the narrow streets, first ridding pillion on the back of a motorbike taxi, then on foot. We visited an art gallery, where graffiti artists were teaching their craft to kids only once they could prove they were regularly attending school. We saw a “typical” dwelling and learned the “rules” of where and how to build in a Favela. We went into shops that enterprising residents had set up, tasting local food and drink (cachaca flavoured with a crab and sugar cain). Whether that later was genuinely something drunk in the Favela or merely a trick played on gullible Gringos I am still unsure. Finally we saw a day care centre that our tour company had set up, looking after kids whose parents worked all day. It was great to see the children laughing and playing as well as some if the older ones being thought English, a skill that is typically lacking in Brazil but I believe will only help them in the future. All in all I found the experience a really positive one. Although seeing the conditions that people were living in was disheartening, and hearing how in the 80 years if the Favela’s existence, it’s only in the last 2 years that the Federal Brazilian Government has invested in the area, and only then as part of their FIFA World Cup and IOC Olympic commitments. But at no stage did we feel threatened and the people were all incredibly friendly and genuinely seemed to be making the most if the situation. If this is a genuine picture of life in a Favela then it’s great to have been able to see it. If its a picture being put on for the foreigners then that is a shame, but I’m still glad I did it.